What is an Indian Meal moth? 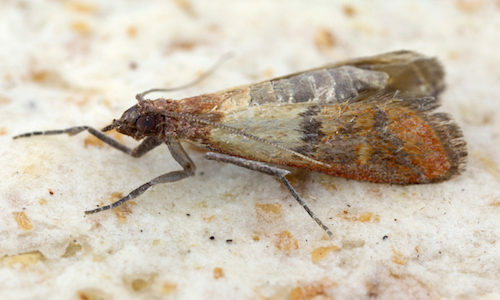 Adult Indian Meal moths are small, just under a half an inch long on average, with a wingspan just slightly longer than the length of their bodies. Their wings are a light grey fading into bronze-y brown with distinguishable patterns in a blackish-brown. Otherwise known as Plodia interpunctella, the Indian Meal moth got its colloquial name from how frequently it eats “Indian corn” or maize crops. A single female can lay up to 400 eggs after mating and upon hatching. The larvae are capable of completing their development into adults in just six to eight weeks. They won’t bite or sting you. They are not poisonous or venomous. What they are, however, is troublesome. Indian Meal moths are capable of causing a good amount of damage. They’re known as surface feeders, which means that if they find a reliable source of food (such as what they can find in your kitchen or garage), they will keep coming back. Indian Meal moths leave behind spun silk that collects waste within the food they’ve infested. Nobody wants to eat contaminated food. In that way, they are potentially dangerous. Why do I have Indian Meal moths? More than any other thing, these pests are motivated from their desire to access the dried goods they consider a main food source. They love things like bird seed, pet food, cereal, crackers, bread, pasta, rice, flour, spices, dried fruit, nuts, and the like. If these things are easy to access in and around your home, they’re a huge draw for Indian Meal moths. How can I prevent Indian Meal moths? Here is the most important way to prevent Indian Meal moths is to make sure all the food in your pantry is stored correctly. They are a pantry pest, looking most readily for reliable food sources. The best way to prevent them is to make their access to food too difficult to be worth the effort. Use airtight containers for dry goods like cereal, crackers, and pasta. If you have grain or other things stored outside, make sure the containers they’re stored in are secured against infiltrators. After that, try to prevent them from getting inside your home in the first place. Patch up and re-seal any cracks, holes, or openings in the perimeter. Check around doors and windows especially. How can Gregory Pest remove Indian Meal moths from my home or business? 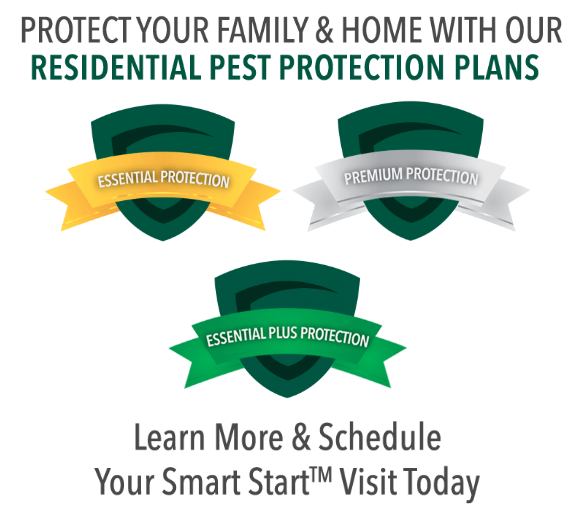 An expert from Gregory Pest Solutions will be your full-service pest solutions provider. We specialize in the effective removal and prevention of Indian Meal moths and their nests from your home or business. When you hire us to evaluate how extensive your home’s pest problem is, one of our pros will assess the situation and formulate an environmentally-friendly plan for removal and prevention. Once we implement our plan, our experts will remove the pests and make sure they can’t come back, to ensure your family can enjoy a lasting insect-free environment.